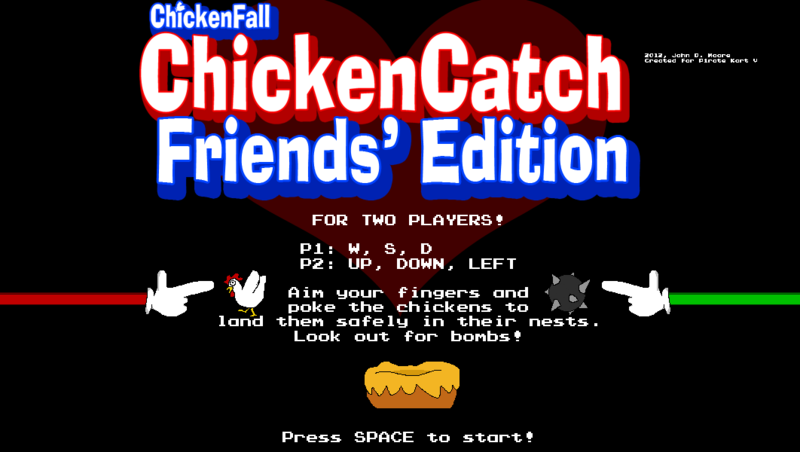 In this first fresh, fast, and furious action-puzzle spin-off of the CHICKENFALL franchise, use your mouse to poke and prod the falling chickens into the nests. Look out for bombs! CATCH THOSE CHICKENS. HINT: Holding down the mouse button longer will extend the fingers farther. You’re a chicken falling helplessly through a dangerous chute of some kind. Don’t fall into a crate, or you’ll die! Flap your wings to resist gravity for just a moment and flap yourself to the safety of your nest!